Ben Wyse has ridden a bicycle as his primary and preferred mode of transportation for over 20 years. With an interest in serving bicycle commuters, he started working at a local bicycle shop in 2001. 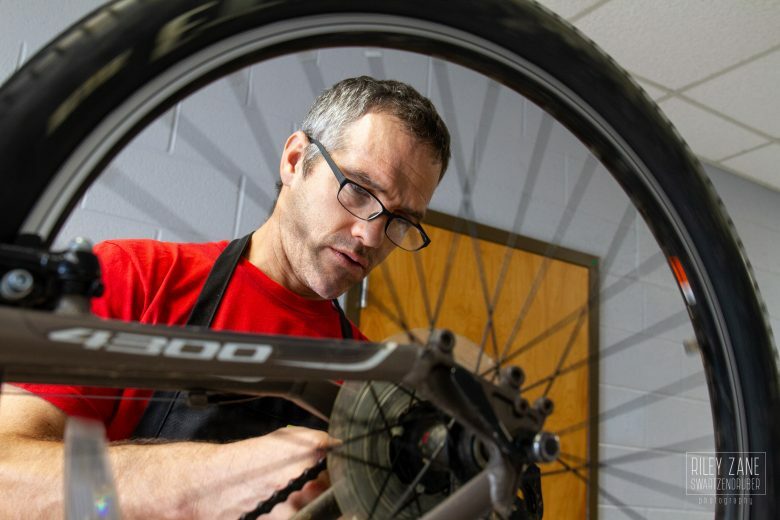 Over the years that followed the idea of starting his own mobile bike repair business began to take shape. Consulting with and learning from other mobile shops proved difficult, as Ben was unable to find any that used only bicycles, and not vans or trucks. So it felt to Ben like an experiment in sustainable business models when Wyse Cycles officially opened in early 2009. Since then business has steadily grown, and Ben has found opportunities to support and advise other human-powered mobile bike shops like his in other parts of the country. “Bicycle commuting has been a deeply empowering part of my life for decades. Encountering some of the pain and destruction present on this earth has inspired me to work for change through my work with bicycles. While riding a bicycle is fun, it can also transform us at a personal level, improve our communities and be a force for positive change in the broader world. Wyse Cycles is a mobile repair business. We come to you! Stop trying to stuff your bike into your car, or worrying about when you'll have time to drop off a bike and pick it back up from a bike shop. Have a garage full of bikes for the whole family? We'll come by and and service all of them together. Plus, you and your kids can learn about your bikes and how to fix them while we're working. Wyse Cycles also works extra hard to assist commuters and people who don't own cars. Cycling is fun, healthy and good for the environment. But Ben rides the extra mile by incorporating cycling in all aspects of his business. Cycling to the jobsite means a car and conventional retail shop aren't necessary, lowering business overhead and making it feasible to repair bikes and parts that would be discarded or recycled in traditional bike shops. Because of it’s unique business model, Wyse Cycles is quite possibly the “greenest” bike shop in the country.